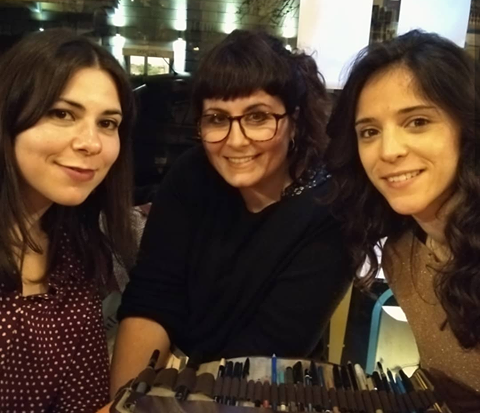 On Saturday 23 November at 6 P.M. we had the pleasure and honour to present Le sorelle Brontë, the brand new graphic novel by Manuela Santoni published by Beccogiallo, and entirely dedicated to our favourite sisters. We also wrote its afterword and in this article we’ll try to explain why we are so proud of this book. 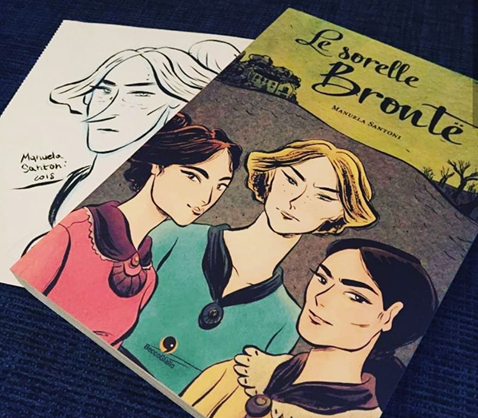 Let’s start with some information about this book: Le sorelle Brontë is the first Italian graphic novel entirely dedicated to Charlotte, Emily and Anne Brontë. Manuela Santoni is the author and artist behind this work, and she’s a very talented and resourceful young woman. She has got a degree in Art History and she’s attended the Master di Illustrazione Ars in Fabula in Macerata. Her Brontë graphic novel literally stole our heart. With great pleasure and emotion we followed Manuela during the whole creative process of her work as research advisors, and we’ve also written the afterword of this book. We are very proud to be somehow part of this project, because Manuela’s book is brilliant and it’s something that people really need to read. She was able to draw attention to these writers who are, sadly, still so little known here in Italy, and she did so in a very smart and lively way, thanks to her graphic novel. Furthermore Manuela wanted to give her book a very interesting twist- the story is in fact told by Branwell, the very tormented and lonely brother of the most well known Brontë sisters. Can you imagine how thrilled and happy we were to be there at the very first official launch of the book? Once again Libreria Tra le Righe in Rome was the perfect place, and we spent there a lovely Brontë afternoon interviewing Manuela and chatting with the curious audience. Why read Le sorelle Brontë? Well, this is a very frank piece of advice for true Brontë lovers. Le sorelle Brontë will surprise you. Because of the really authentic atmospheres that the writer was able to create, and also because of the creative soul of the work. As a matter of fact you’ll be able to wander in a story where things didn’t follow the actual flow of the events, and you can actually get lost in a “what if” mood which… well, enough, no more spoilers. If you need another reason to read it, remember that we have written its afterword! Seriously, this is a great book. We totally suggest you to read it. If yo can speak Italian and are curious to know more you can watch this interview to Manuela Santoni. This video had been shot before the book was published. Instead, if you are looking for Brontë Christmas presents, then don’t miss Our Book, E sognai di Cime Tempestose- Curiosities and an excerpt.